Setting up a web form that your site visitors can use to send you a message can be a challenging task for some. For sites using WordPress, however, this tedious job can easily be accomplished by the use of a WordPress plugin. 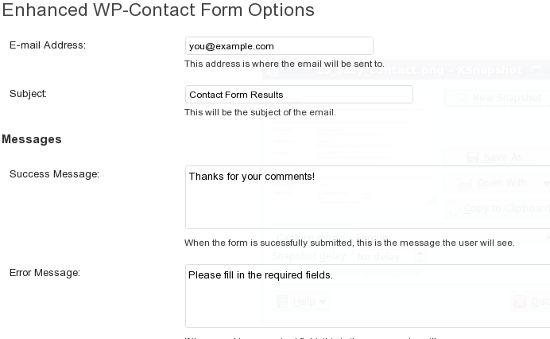 Let’s take a look at some free contact form plugins for WordPress. 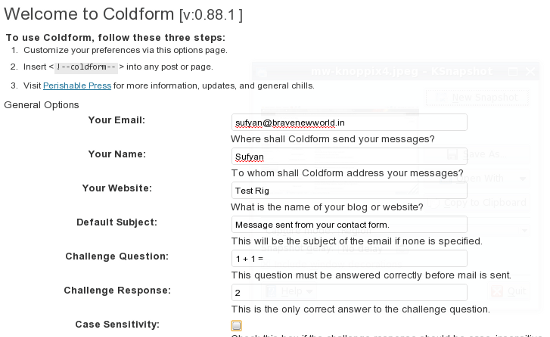 Contact Coldform is an easy-to-use, no-nonsense contact form plugin that’s very customizable. 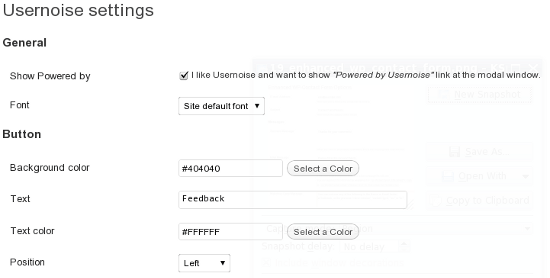 You can add a contact form to any given page or post using a simple shortcode. One thing to note about this plugin, though, is that its update frequency is slower than the other plugins. 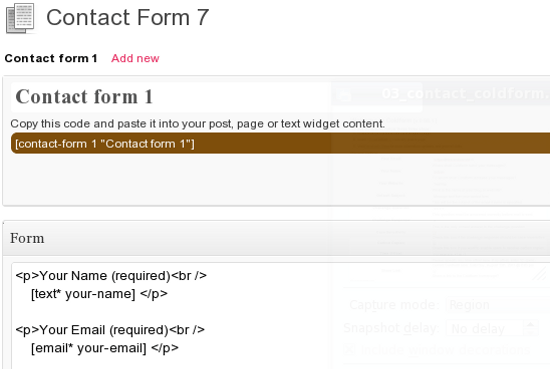 Contact Form 7 is one of the most used contact form plugins for WordPress. It supports Ajax filtering, the ability to challenge form submissions using CAPTCHAs and spam filtering integrated with the well-known Akismet WordPress plugin. 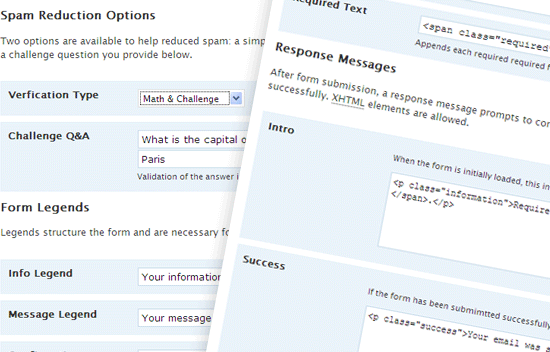 While Contact Form 7 offers many useful features, its UI may seem daunting to non-developers. 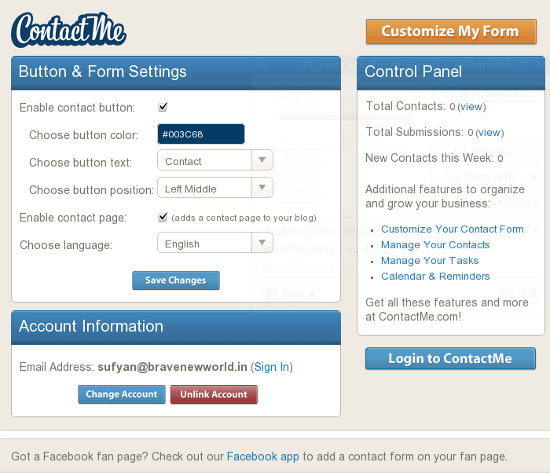 Contact Form by ContactMe.com is yet another feature-rich contact form plugin for WordPress. The plugin offers three variants: two paid plans and a free plan. The free version allows you to create a contact form for your WordPress-powered site, but lacks some features (such as the ability to attach files) and has a limit of one contact form per site. 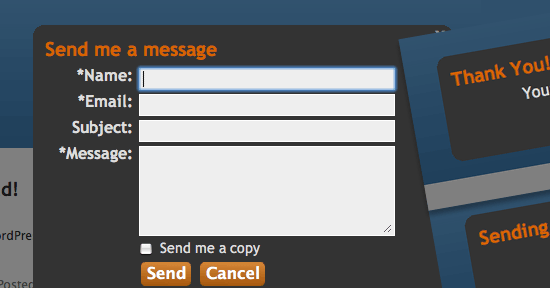 Once installed, you’ll need to provide your email address in order to create an account on ContactMe.com. 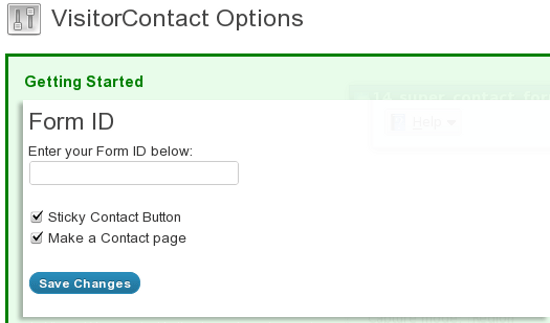 Custom Contact Forms is one of the most feature-rich and customizable contact form plugins out there. It lets you tweak many aspects of your web form and allows you to create custom "thank you" pages after the form has been submitted. Fast Secure Contact Form lets you create an unlimited number of contact forms. It has support for file uploading, with the option of restricting the type and size of the files that could be uploaded. The plugin additionally offers Akismet integration for spam protection, database backups of submitted contact forms, auto-responder emails that are sent after a contact form is submitted and more. ONW Simple Contact Form is a straightforward contact form plugin. You can configure it to work with reCaptcha. 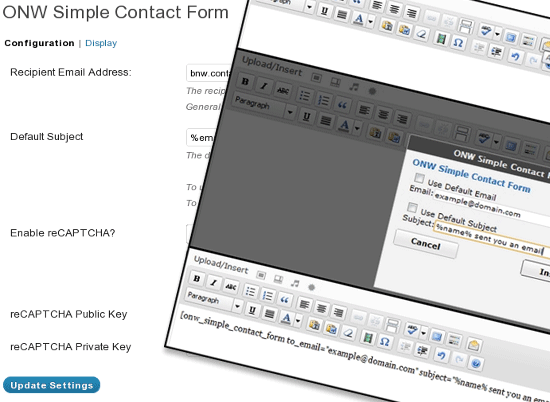 Apart from being able to create contact forms using shortcodes, ONW Simple Contact Form also adds a button to the WordPress visual editor that lets you insert contact forms while composing posts and pages. SimpleModal Contact Form is a modal-window contact form that uses jQuery. SMCF can be configured to provide you with the contact form submitter’s IP address as well as the option to send the contact form user a copy of their own message. 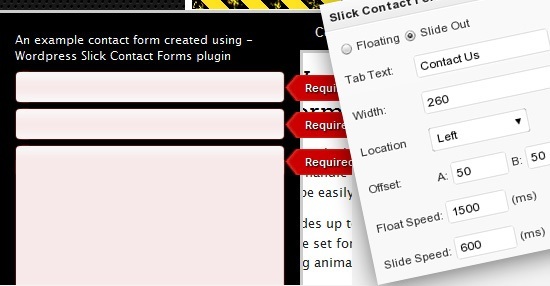 Slick Contact Forms is a WordPress plugin that creates a widget that can be used to add multiple contact forms on a web page. The forms can be floating, dropdown, sticky or even sliding in appearance. WP Flex Contact Form is a WordPress plugin made in Flex/Flash. It claims to reduce spam messages because most spam bots can’t deal with Flash. 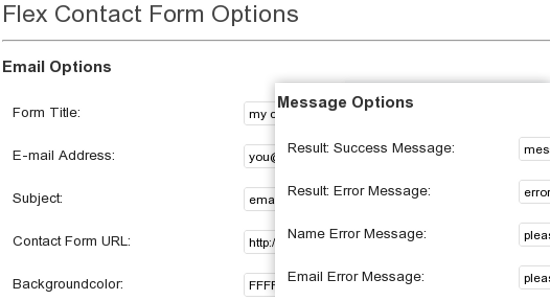 You can tweak the background color of the form and set custom error messages. This contact form WordPress plugin lets you add a contact tab on your website. 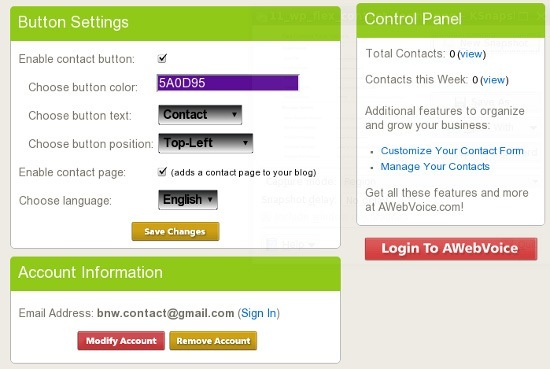 You will need an account with AWebVoice in order to use the plugin. Simple Contact Form is a plugin that lets you add contact forms in any area of your WordPress theme. It uses Ajax to avoid page reloads, making the experience of using your contact web forms smoother and quicker. 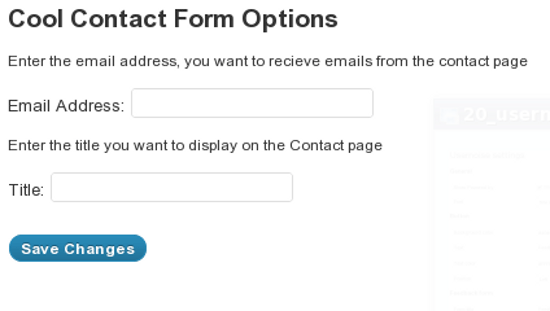 Super Contact Form is a small plugin that’s also super simple to use. 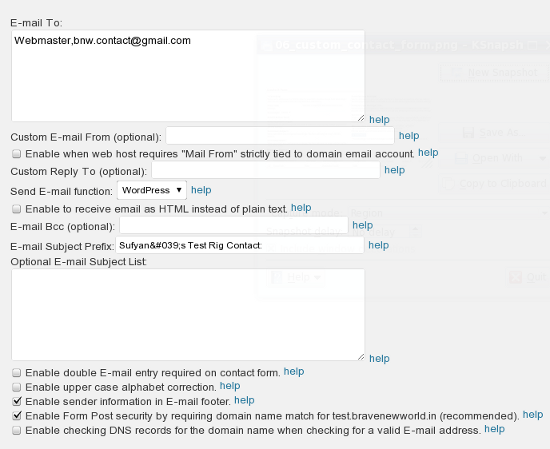 You just need to specify your email address in the WordPress admin panel after it has been installed. A word of caution: the reviews of this plugin at WordPress.org are not very encouraging. Notable features of this WordPress plugin are geolocation (which helps determine where people are from) and integration with Google Maps. However, like Akismet, it requires you to create an account at the plugin’s website to get your Form ID (it’s needed to activate and use the plugin). WD3K is an Ajax-powered contact form that uses the Contactable jQuery plugin. If you wish to add a sliding contact form that’s persistently displayed in your WordPress theme, you should definitely give this plugin a shot. 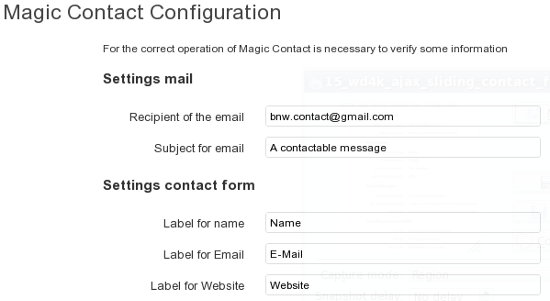 Magic Contact is an Ajax-powered plugin that is similar to WD3K Ajax Sliding Contact Form above. Easy Contact, partly based on WP Contact Form, is a WordPress contact form plugin that has a GUI for customizing your contact form, the ability to use shortcodes so that you can embed your form using the WordPress editor without modifying your theme files and information-gathering options for tracking your contact form user’s referrer, browser type and IP address. 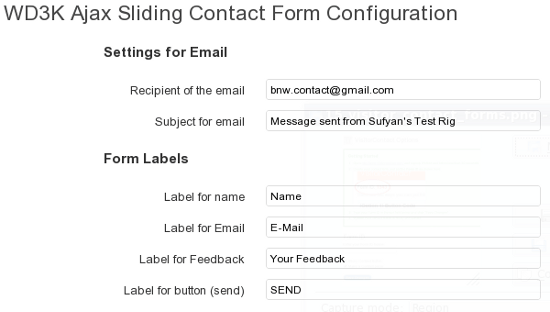 This contact form plugin was developed by Joost de Valk, a well-known plugin author in the WordPress community. He’s authored plugins such as WordPress SEO Plugin and the Google Analytics plugin for WordPress. This contact form plugin adds a persistent "Feedback" button at the side of your WordPress theme’s layout that, when clicked, displays a slick modal-window web form. It’s a plug-and-play contact form with minimal setup involved (it even inherits your theme’s typography automatically). This plugin is a simple, no-frills way of integrating a contact form into your WordPress site. You can create contact forms using shortcodes so there’s no need to modify your WordPress theme files.